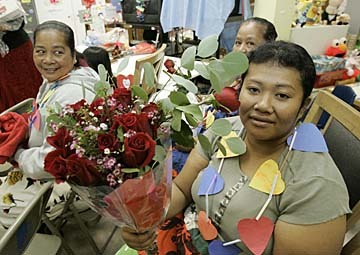 Esfina Espin held a bouquet of roses after she and other families sang songs of thanks to representatives of the Weinberg Foundation for a $200,000 donation to the Institute for Human Services' Women and Family Shelter in downtown Honolulu. Kerny Eter, left, and Mirony Eria, behind, also participated in the ceremony and songs. Bob Honda, Randall Ajimine and Kara Kuba held signs yesterday at the corner of King and Bishop streets spelling out "you're appreciated." They were among a group of people participating in an art project by University of Hawaii art graduate Nate Chung called "Downtown Love." Chung said the project was basically to make people feel good and get some smiles.